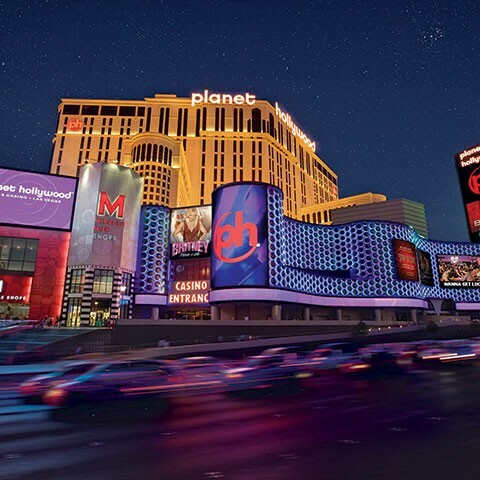 Planet Hollywood Resort & Casino is the newest member of the Caesars Entertainment family. The hippest property on the Las Vegas Strip, Planet Hollywood boasts 2,500 beautifully designed guest rooms and more than 100,000 square feet of casino floor. Dining options at Planet Hollywood include KOI, Strip House, an award-winning Spice Market buffet, LA’s Pink’s Hot Dogs and many more notable outlets. Other property highlights include the Extra lounge and Planet Hollywood Spa by Mandara. The property is encircled by the Miracle Mile Shops with more than 170 specialty stores and restaurants. At Planet Hollywood’s high-energy casino, you’ll have an A-list, movie star experience. From go-go dancers and flashing lights to upbeat music, this Las Vegas casino is the epitome of glamour and excitement. Bring your entourage and get ready for an unforgettable night. Go for the big bucks at popular table games like Vegas blackjack, roulette or craps or poker. This Las Vegas casino takes it up a notch, featuring dealers donned in racy lingerie. The energizing Vegas casino also offers 1,200 slot machines, ranging from penny video slots to popular progressive games like poker, Wheel of Fortune, Megabucks and Monopoly.Play the real deal at one of the casino’s 11 tables. Take a chance with MEGAbeat, one of the world’s largest progressive jackpots. Open around the clock, the Vegas poker room is located on the casino floor, next to Heart Bar.